asciilifeform: other item, is that a main bootloader built for this thing, theoretically will also work on the c100pa, which has no cr50. asciilifeform: what i have not found a way to do, is to neuter cr50 in the sense originally wanted , where it turns into simply battery controller and nobody can rewrite from snake. asciilifeform: diana_coman: to be very specific, i did not properly break cr50. 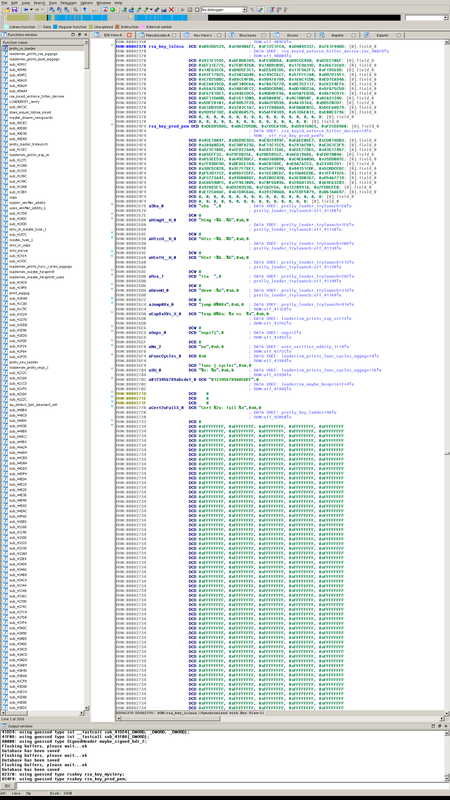 what i found instead was an apparently-Official (albeit undocumented) knob in the most recent fw release, which does equiv of rma unlock ( sets all of the permission bits for console ) and enables spi bus access, through which can r/w the main and ec fw turds. asciilifeform: mircea_popescu: i did describe a theoretical 'bake pad-for-pad replacement for cr50' variant. asciilifeform: phf: what plug hole. thing charges from the usbc jacks, cr50 actually drives the charger logic. 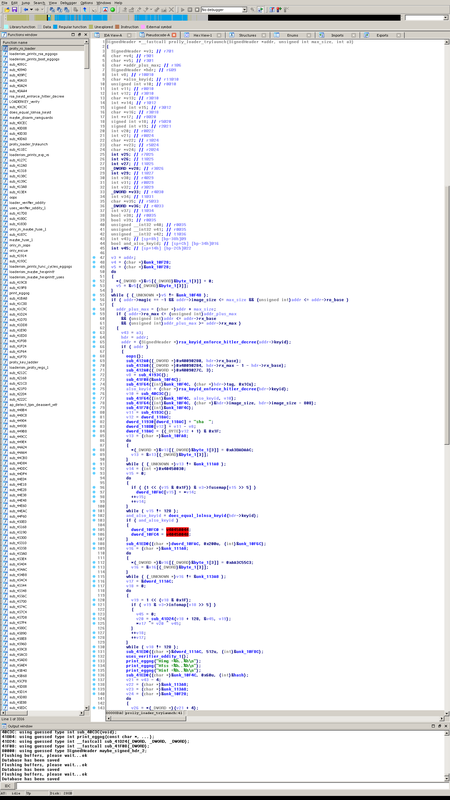 asciilifeform: re: cr50, fwiw i have pretty much whole thing multiply massaged in ida, code/data mapped, got good % of the functions 'usefully' named. but so far no dice in finding a usable hole. asciilifeform: at least google fwiw didn't try to advertise cr50, similar 'feature'. asciilifeform: going in order: (1) is the sig header tested by the boot maskrom ( contents not known, but can be guessed at, it has 1 hard-wired pubkey ). this we will call cr50 hitler key #0 . it cannot be changed by fw updater. lobbesbot: phf: Sent 2 hours and 54 minutes ago: <asciilifeform> other interesting observations: 1) loader is not the same as what appears in the src, in either 3.3 or 3.4 fw bin; not only key differs, but eggog strings, and possibly the rsa per se. 2) seems like : nowhere else in the fw is there any other routine which checksums/rsaverifies the cr50 fw , or references the rsa keyz at all other than to print keyid . 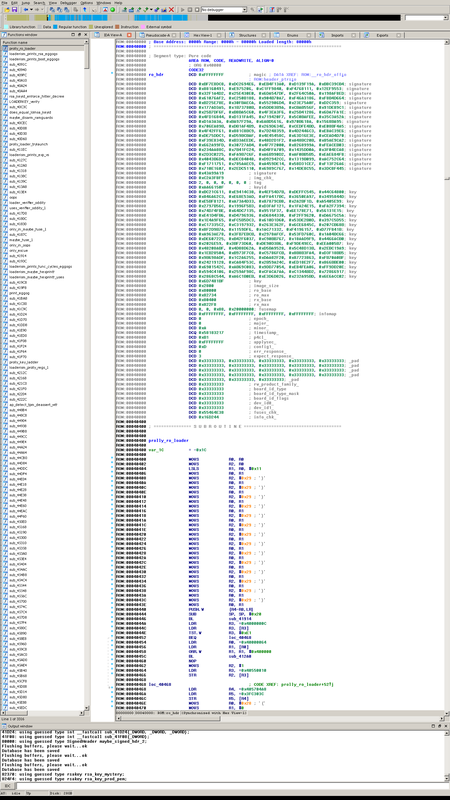 asciilifeform: !Q later tell phf other interesting observations: 1) loader is not the same as what appears in the src, in either 3.3 or 3.4 fw bin; not only key differs, but eggog strings, and possibly the rsa per se. 2) seems like : nowhere else in the fw is there any other routine which checksums/rsaverifies the cr50 fw , or references the rsa keyz at all other than to print keyid . a111: Logged on 2018-06-13 16:48 asciilifeform: and i'm still curious what an elephant-killing dose of gamma would do to the cr50. asciilifeform: but would need at least 1 actually popped cr50 chip, to tune the probe. deedbot: loper_os_cr50_ voiced for 30 minutes. phf: also contest starts around the time that ascii publishes articles on subj, conceivable that someone else decides to look at the cr50, white hats a vulnerability to google. asciilifeform: meaningful. 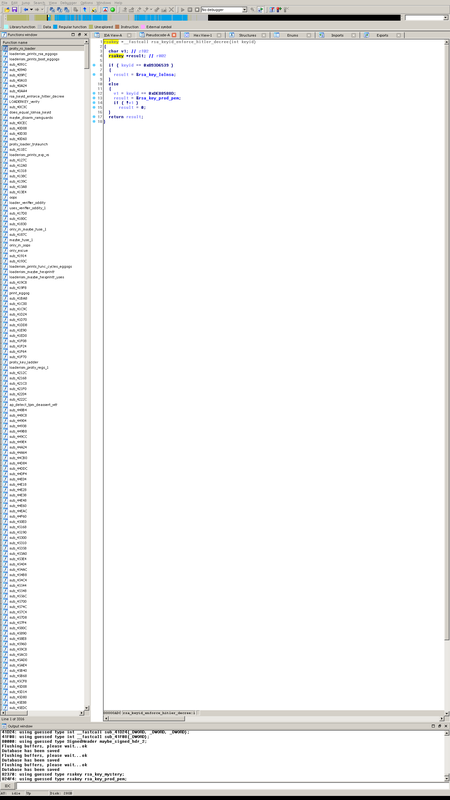 i either get a pile of c101pa with rewritable cr50 256kB firmwares, or not. a111: Logged on 2018-06-12 23:39 asciilifeform: phf: you will test using your c101pa. and so you will need the debug snake, i will need to put the output of sysinfo , ver , brd , etc cr50 console commands into the statement.